Now, back in the’Thirties, there were cartoons that used vocal groups as a sort of Greek Chorus, giving exposition to the viewer. But this practice had pretty much been abandoned at most cartoon studios, whether on the East Coast or out in California. Not so at Terrytoons, however. As it had been with sound. . . and with color. . . and as it would be with wide-screen processes. . . so Terrytoons would fall back on this trope, as late as 1957 releases. The practice finally ended with the rise of Gene Deitch and his avant-garde style of cartoons. Not all Terrytoons use this device. Some have narration by Tommy Morrison, or by another announcer. Others just get going, without recourse to such an old-fashioned practice. And not all of the ones that do use this practice use the vocal group identified by Chuckles Gardner and myself as being Helen Carroll and the Satisfiers (or whatever name they might have been using after the end of their gig on the “Chesterfield Supper Club”). Some use a male quartet, which might well include both Roy Halee (singing voice of Mighty Mouse, and also heard on some “Heckle and Jeckle” cartoons where they did not use Dayton Allen), and Tommy Morrison. Others take this quartet and add the soprano who usually assayed the role of Pearl Pureheart in the “Mighty Mouse’ cartoons that involved her and Oil Can Harry. However, more than a score of cartoons have been aurally identified, either by myself, by Chuckles, or by the both of us, as having Helen Carroll groups. We know that Helen Carroll continued to work with groups similar to (when not identical with) the Satisfiers after the gig for Chesterfield ended. In 1949, her group was called the Carolers, backing her up on a Mercury records’ cover of “Cruising Down the River”, which had a cup of coffee on the Bilboard magazine’s Top Thirty, but whose sales paled in comparison with other versions, such as that of Russ Morgan. 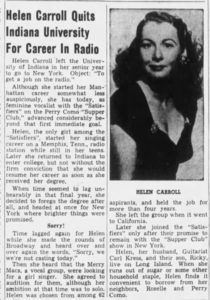 And in 1950, Helen and a group called the Swantones backed up Frank Sinatra on a cover of “Life Is So Peculiar”, a disc that did not make any of the charts. Eventually, she regained the rights to the name “The Satisfies”. The group cut an album for Columbia in or around 1957. Most of the above cartoons are easily accessible. So, go ahead and listen for yourself–and hear a pretty good mixed vocal group, led by a woman with a talented and flexible voice. The use of vocal groups “moving the cartoon along” with harmonic vocalizing of storytelling was used so much at MGM. I could be wrong, but I think this was used at MGM even more than it was at Disney. You can hear such vocalizers, mostly female, on cartoons like “THE LITTLE GOLDFISH” and “MRS. LADYBUG” and, as with the Terrytoons cartoons, perhaps one of the female vocals played a character in the cartoon. In “MRS. LADYBUG”, for example, one or more could have voiced the title character or one or more of the wild little offsprings. Yet, when Terrytoons did this, there was more a jazz vocal sensibility to them, but of course, you’re talking about a vocal group, as you pointed out, that even backed Frank Sinatra on occasion. I don’t know if that afore-mentioned vocal group at MGM ever had any gigs that would be more recognizable to the general audiences through radio broadcasts or recorded “hits” of the day. Is it possible that the vocal group on hand for Warner Brothers cartoons like “THE CAT CAME BACK” and incidental performances throughout the PORKY PIG black and white classics was also the same vocal group that highlighted plot points in those classic MGM cartoons? Ken, you may be correct about the femle groups being the same on WB and MGM.. I mean, KEVIN.. (and again, both Morgan and Barron are forgotten ?? …great song.,.. Great research, James. I’d love to see you do some detective work into the singers/vocal groups used in early/mid 30s Terrytoons as well, certain performers such as Roy Halee went back that far with Terry I believe.